Many flowering trees need cool winter temperatures to bear abundant blooms. When proper winter chilling combines with moderate spring temperatures, spectacular floral displays can result. Situated on the Atlantic coastline, New Jersey spans U.S. Department of Agriculture plant hardiness zones 6a through 7b. With average winter extremes from 10 degrees below zero Fahrenheit to 10 degrees above, native and non-native flowering trees respond with prolific blossoms. Along with the beloved spring displays Easterners expect, some unusual early blossoms beautify New Jersey gardens. The Persian ironwood (Parrotia persica) bears remarkable, petal-less red flowers in March and early April. The dense, brilliant, anther-filled blossoms appear before the tree's foliage appears. Hardy in USDA zones 4 through 8, Persian ironwood grows up to 40 feet tall, adding exfoliating, cream-and-green bark and colorful yellow, purple and red fall foliage. The native Paw Paw tree (Asimina triloba), hardy in USDA zones 5 through 9, adds distinctive, leathery, red-purple flowers in late April. The small, yet striking, flowers yield large, fragrant, edible fall fruit on trees up to 20 feet tall. While its April branches are still bare, native flowering dogwoods (Cornus florida) burst into clouds of white blooms, with some cultivars bearing pink flowers. Hardy in USDA zones 5 through 9, trees up to 30 feet tall offer rich, purple-red fall foliage as well. 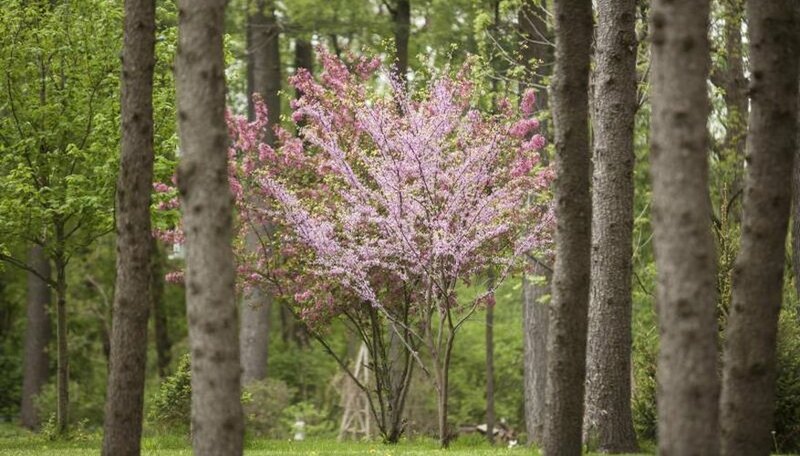 Overlapping dogwood blooms, the native redbud (Cercis canadensis) showers New Jersey landscapes with edible, lavender-pink flowers in early May. The tree reaches 20 feet in height, with heart-shaped foliage, and suits USDA zones 4 through 9. Serviceberry (Amelanchier laevis), a native hardy in USDA zones 4 through 8, brings white May flowers on 15- to 40-foot trees. Sweet, edible, purple fruit and brilliant red foliage finish the show in fall. Fragrant, wisteria-like, white flowers of the native American yellowwood (Cladrastis kentukea) grace New Jersey as summer begins. With some pink-bloomed varieties, the 8- to 14-inch panicles hang on trees 30 to 50 feet tall. Hardy in USDA zones 4 through 8, the tree turns butter-yellow with fall foliage. In June and July, the intensely fragrant, elegant, white blooms of the southern magnolia (Magnolia grandiflora) fill the air near this 15- to 30-foot tree. At the same time, flowers of the 20-foot-tall native sourwood (Oxydendrum arboreum) hang in 4- to 10-inch white racemes, drawing native pollinators in abundance. Fall brings lustrous red foliage. Both southern magnolia and sourwood are hardy from USDA zones 5 through 9. New Jersey's flowering possibilities continue as summer wanes. Beautiful, single white flowers with prominent golden centers shine from the Benjamin Franklin tree (Franklinia alatamaha) in July and August. Hardy in USDA zones 5 through 8, the memorable 20-foot-tall tree presents red foliage in fall as well. While the native cucumber magnolia (Magnolia acuminata) blooms most abundantly in April, it deserves special mention for the flush of September flowers it brings New Jersey landscapes. Hardy in USDA zones 3 through 8, the large, 60-foot-tall tree celebrates fall with a repeat of showy, fragrant, yellow-green, tulip-like blooms. The bumpy green fruit that inspire its common name mature to red against the tree's golden fall foliage.